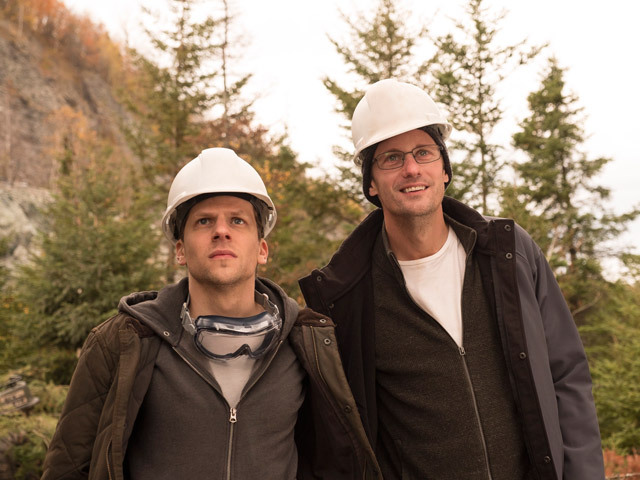 Synopsis: In this epic tale of humanity versus corporate greed, cousins from New York, Vincent (Jesse Eisenberg) and Anton (Alexander Skarsgård) are players in the high-stakes game of High Frequency Trading, where winning is measured in milliseconds. Their dream? To build a fibre-optic cable in a straight line between Kansas and New Jersey, making them millions. However, nothing is as straightforward as it seems. Anton is the brains, Vincent is the hustler, and together they push each other and everyone around them to breaking point to achieve their goal. Breathing down their necks is their old boss Eva Torres (Salma Hayek), a sociopathic trader who will stop at nothing to see them fail. Many years ago, I was struck with this amazing premise of people digging thousand-mile long tunnels to try and shave a couple of milliseconds off the time it took to make their stock market trades. Madness. It immediately made sense to explore if there was a movie to be made around that high concept... I had this haunting image in my head of stock market hustlers struggling to walk through swamps and muddy forests in their expensive suits, putting their sanity on the line all for the good old dollar. Little did I know how complex bringing this to the screen would be. We talked with experts of every scientific expertise you could imagine: quantum physics experts, fiber optic physicists, highly specialized tunnel digging experts who dig hundred-mile-long, four-inch-wide tunnels for a living. High frequency trading experts dealing with billion-dollar money flows on a daily basis... Boy, what a ride. In retrospect, there is something about bringing forward what seems to be a metaphoric world, when in fact most of what is in the script is, in some way, true to life.